Lenten Meditation: Embrace Forgiveness, Embrace Life! The total payment has been made. The slate is wiped clean! We are lavishly loved and forever forgiven in Him! So we can quit trying to earn what we already have in Christ. We can live the abundant life the Lord has promised...the resurrected, indwellingChrist living it through us...as us, not as someone we admire or think we should be like. Let the truth of this song wash over you...live the life the Lord has given you...Him living through you! So WHAT was finished? What wascomplete at the death of Christ? “My food,” said Jesus, “is to do the will of him who sent me and to finish his work." ...so that there was nothing left to be done to bring us to a Holy God! This has HUGE implications for us! 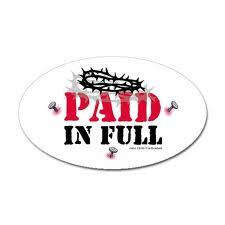 Jesus did everything that He needed to do... ...for our salvation from the penalty of sin! ...for our Christian life on this earth! ...for our eternity in glory! WHAT did I die to through my union with Christ? I've been disconnected from my selfish self as my source of life; I've been disconnected from the fleshly and sinful attitude of independence as the source of my life; I've been disconnected from the need to do good works (religious and otherwise) to earn God's favor (I already have God's favor in Christ); I've been disconnected from the power of the lies of the enemy (for a good example of this, see Caught in the Web); I've been disconnected from the world system with its values and mindset as my source of meaning in life. 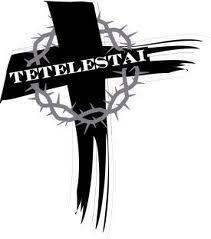 And that's worth shouting about...Tetelestai!